After Kimberley Eaton’s mother Jacque married BD Diesel Performance owner Brian Roth in 2009, it was only a matter of time before Kimberley’s life changed in more ways than the obvious. Kimberley’s stepfather introduced her to her first diesel truck, a leveled 2002 Duramax Extended Cab, just a year later. With minimal mods just to increase fuel economy, Kimberley used it as her daily driver to haul her horse trailer during her time at Olds College in Alberta, Canada, for equestrian training, her other passion. “I have a competitive attitude, which made me eager and determined to know more about horses than I could learn from a book,” Kimberley explains. But everything was suddenly interrupted in January 2012 after a terrible accident. Her truck was written off due to damages; luckily, Kimberley and her passengers made a full recovery. Kimberley decided then and there to use the insurance payout to look for her next diesel. When Kimberley and Brian put their heads together to search for the right truck, they thoroughly went over all the pros and cons of every vehicle. After all, they planned on using her next build for advertising purposes and in the Research and Development department at BD Diesel Performance. When they found a 2002 Black GMC Duramax Crew Cab, they knew it was the perfect fit. Kimberley loved the platform of the LB7 with the Allison transmission. Since the truck had previously belonged to an existing customer, it already had BD products and a great history with BD Performance. All of this combined with the price tag beat out every other truck. After claiming the 2002 Duramax as her own, Kimberley was more than ready to turn her attention to some modifications. Fuel economy and low temperatures were her main goals, as she planned on towing plenty of weight up steep hills. Kimberley had a chip, exhaust, and intake installed first, followed up by a BD Transmission package including torque convertor and valve body. A BD Intercooler was selected for lowering her EGTs and a BD AUX Cooler was next to keep the transmission cool. 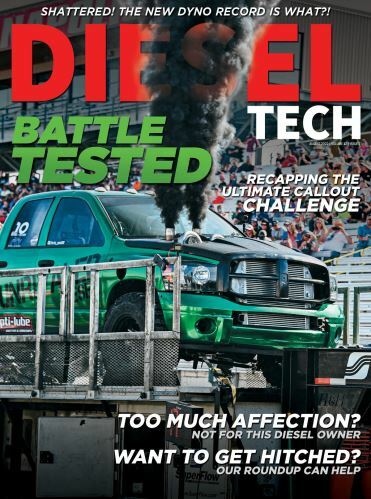 “The truck dyno’d in at 328hp on BD’s in-ground dyno,” Kimberley grins. The onboard air system was used for the train horns she added. When BD Diesel released its Duramax Tap shifter in 2013, Kimberley was eager to try it out, knowing it would really help with downshifting or upshifting when needed. “Over the next few years, minor exterior modifications were done, such as ladder bars and a custom drop hitch for sled pulling, tow mirrors, a lift, and a custom switch panel to control all the extras,” Kimberley sums up. She also snagged a set of custom shotgun stacks built by her friend Stephen Friss-Jensen, and after receiving a sponsorship from DMAX store this past April, she was outfitted with a full Kryptonite front end steering package, a TCASE brace and upper control arms. “My goal is to make my IFS front end as strong as possible without going to a solid axle, and this Kryptonite kit is doing just that!” Kimberley enthuses. In addition to previous modifications, a custom Ballistic S464 charger kit was also installed, along with a Flow-Max lift pump and filter kit, a TurboSmart Wastegate T4 Turbonetics cast flange (which is no longer available), SS Turbo feed pipes, a front receiver hitch for weights, BD exhaust manifold, BD R900 CP3 pump, BD 90hp injectors, a torque convertor lock-up control module and EFILive with transmission and engine tuning by Valley Fuel Injection. Thanks to the EFILive, she was also able to upgrade to an Edge Insight CTS2. Up until 2016, Kimberley was competing in the Work Stock class for sled pulling across various states and Alberta, Canada. Thanks to the upgraded charger, she was able to move up to the 2.5 Sled Pulling class and purchased a 2003 ALH TDI Jetta so her truck could be exclusively built up for sled pulling. Along with plenty of competitions, Kimberley uses her new ride for “pretty much everything possible.” She tows her horse trailer over the Rocky Mountains to and from Alberta numerous times, as well as locally to and from horse shows. Getting so involved in the industry hasn’t been without its share of difficulties, however. On the flipside, there’s been a good share of encouragement as well. The biggest credit of all, of course, would have to go to her stepfather, Brian. “He’s taught me everything I know about diesel trucks. His passion became my passion,” she smiles. If you have any misgivings, just look at Kimberley’s mighty Duramax High Maintenance, and that should brook no argument from you.